hrow a chopper party for boys and girls big and small. PartyCheap.com has chopper party supplies for chopper theme birthdays and motorcycle parties. Even if you don’t have a motorcycle yourself, it is fun to play pretend. You can browse through all of our motorcycle party supplies here or use the search feature above to find a specific chopper related item. If you want to dress up for your motorcycle party or are looking for some inexpensive gifts for your guests take a look at our Black Chopper Scarf Hat. We also have the chopper scarf hat in red and a flame bandana that you can either wear or use as a decoration. Our black chain beads with skull and cross bones let’s everyone know you are a tough motorcycle guy, or girl. To really make your chopper party official you need some chopper cutouts, a chopper centerpiece. Throw a flame filled motorcycle or chopper party for the bike lover in your life. PartyCheap.com has all the motorcycle party supplies from table supplies to hanging décor you’d need to throw a great motorcycle party or chopper birthday party. It’s time to get the motor running for the bike enthusiast in your life! Whether it’s a birthday or simply having a “Guys Night Out” we offer plenty of gems that will make it a memorable event. Start by surrounding the space with flames. No, not actual flames, but with our 12 foot long Flame Pennant Banner! Riding a chopper is more than just having fun and being safe, it’s also about burning rubber! Flames are synonymous with going fast, so have an ample amount of fire around the party. Each banner consists of 12 pennants and the entire thing is suited for indoor or outdoor use. Whether you’re tearing up out back or in the living room, this banner can hang at your party. Continue on with the flames by finishing off your outfit with the perfect outfit accessory. 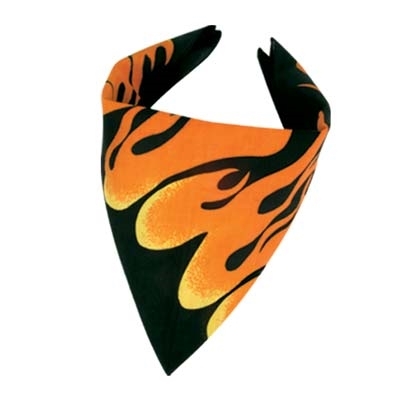 Wear our Flame Bandana to perfectly complete your biker outfit. It’s black, with orange flames on it. Just wear it like you would any other bandana and there you go, a flame bandana! Browse through all of our chopper decorations to give your motorcycle party a little something extra. PartyCheap.com has everything to make your room look like a chopper paradise. Not only will your party the baddest on the biker block, but it will also be the friendliest to your wallet.